A Los Angeles court upheld the $25 million verdict that Cory Watson Attorneys, a Birmingham law firm, helped secure against Nissan in a lawsuit blaming faulty brakes for a car crash that killed three people. 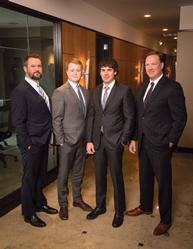 Plaintiffs were represented by Cory Watson Attorneys (L-R): F. Jerome Tapley, Adam W. Pittman, Ryan Lutz, and Brett Turnbull. The case, Cruz v. Nissan North America, et al., was originally tried in the Superior Court of California for Los Angeles County. The jury’s verdict was affirmed on appeal on Wednesday, February 26. “This has been a long road for our clients, and as a firm, we take great pride in fighting for justice and helping bring closure to their grieving families,” said Cory Watson principal attorney Ryan Lutz. The plaintiffs – Hilario Cruz, Araceli Mendez, and Solomon Mathenge – were represented by F. Jerome Tapley, Brett Turnbull, Ryan Lutz, and Adam W. Pittman of Cory Watson Attorneys. Additional representation for the plaintiffs was provided by Paul Kiesel of Kiesel Law LLP, Kirk Wolden of Carter Wolden, as well as Claudia C. Bohorquez and Vicki I. Sarmiento. The case stems from a fatal 2012 crash caused by a critical failure in the braking system of a 2004 Infiniti QX56 SUV. When the Infiniti’s driver collided with a minivan in a Hollywood intersection, all three of the van’s occupants, a mother and her two young daughters, were killed in the impact. The Los Angeles jury determined that the incident was 100 percent attributable to the braking system defect in the Nissan-made SUV, and that Nissan had been negligent in failing to recall the vehicle. “Our hope is that this verdict inspires auto manufacturers like Nissan to step up and take responsibility for the safety of their vehicles. No one should be injured by known product defects like the faulty brakes in this case that are so obviously dangerous,” said Cory Watson attorney Adam W. Pittman. Cory Watson Attorneys is a nationally recognized personal injury law firm based in Birmingham, Alabama, with more than $2.7 billion in recoveries for clients. Attorneys are frequently at the forefront of major class actions and multidistrict litigations involving dangerous pharmaceuticals, and are often appointed to leadership positions in national cases. Firm practice areas include Personal Injury, Product Liability, Class Action, Asbestos, Business & Commercial Litigation, Dangerous Pharmaceuticals, Defective Medical Devices, and Environmental/Toxic Torts. To learn more, visit CoryWatson.com.